Like every other boxing fan on Earth, I would love to see Floyd "Money" Mayweather fight Manny "Pac-Man" Pacquiao. Whether the bout could live up to its hype or be as entertaining as Mayweather's unanimous decision Saturday against Miguel Cotto is questionable. But there's no doubt that the highly anticipated match would be the richest fight in boxing history. Unfortunately, the money might not be enough to entice Mayweather. His $32 million guarantee Saturday was a Nevada record, topping the $30 million that Mike Tyson was guaranteed for his 1997 rematch against Evander Holyfield. In his last three fights, Mayweather has been guaranteed a total of $79.5 million, which doesn't include his considerable take from pay-per-view sales, concessions and other revenue. "This is just a testament to Floyd's [market] power," said Leonard Ellerbe, Mayweather's closest adviser and CEO of Mayweather Promotions. 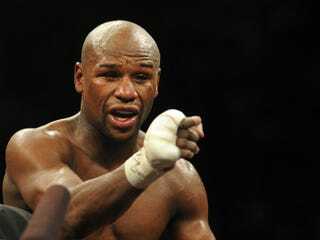 "Floyd Mayweather is a one-man walking conglomerate. Over the last 12 months, he is the highest-paid athlete in sports." Mayweather will be Nevada's highest-paid inmate as of June 1, when he begins serving an 87-day sentence for misdemeanor domestic violence. He faced more than 30 years before accepting a plea bargain and later winning a petition to delay his incarceration until after Saturday's fight. He convinced Judge Melissa Saragosa that his bout on Cinco de Mayo would have a $100 million impact on the Las Vegas economy. That was quick thinking, but he'll still have plenty of time to ponder the question of meeting Pacquiao. Mayweather has gone back and forth in that regard, calling out Pacquiao in a series of tweets in January after arguably ducking him for two years. But Mayweather doused hopes a few days before the Cotto fight, again accusing Pacquiao of using performance-enhancing drugs to increase in size and strength. "Look at the pictures and tell me this man's head didn't get bigger," Mayweather told a group of writers. "This man probably went from a 7 1/4 to an 8. In a hat, a fitted hat. And you're going to tell me this [stuff] is all natural? Come on, man. Stop this. I'm going up in weight, but I ain't just walking through no damn fighters." Mayweather's insistence on blood and urine testing has been a sticking point, although there are reports that Pacquiao agreed to the conditions. Splitting the purse has been an issue, too, with Mayweather reportedly unwilling to offer 50-50. But when the subject of a Pacquiao fight was broached Saturday, Mayweather introduced another sore point: the bitter relationship with his former promoter Bob Arum, who now promotes Pacquiao. "The truth is, Bob Arum is not going to let the fight happen," Mayweather said in the post-fight news conference. "It's not on me. I went to Pacquiao and offered him $40 million and told him I would wire him $20 million within 48 hours. He turned me down and said he wanted a 50-50 split. So once he's free from Bob Arum, will the fight happen? Absolutely. But as of now, he's with Bob Arum, so the fight isn't going to happen." In addition to the $32 million-plus, Saturday's victory gave Mayweather an eighth championship belt and improved his record to 43-0. His legacy as one of boxing's all-time greats in the ring is secure, and his earnings put him near the top as well. With nothing left to prove outside of beating Pacquiao, Mayweather said he's leaning "80-20" toward retirement. "If it was my last fight, I gave them a bang," he said. "There's really no one for me to fight anymore." No one except Pac-Man, whose fans claim that Mayweather is scared. Such taunts might work in grade school, goading classmates to fight, but they won't work against a boxer as established and financially well-off as Mayweather. Maybe he is less than anxious to face Pacquiao's power. Maybe he's reluctant to risk a blemish on his perfect record. Maybe he's legitimately worried about his health. Whatever the case, he has the classic comeback for those who think that fear keeps him from fighting Pacquiao. And it's at a level that the taunters can understand. "You all think I'm scared, I'm a coward?" he said days before the Cotto bout. "Well, guess what? I'm a rich, scared coward. I'm a rich coward. And if that's the case, why the hell would you want to watch me? I don't want to watch no coward. I don't want to watch nobody who's scared, and you all know for a fact I'm not scared. You all know that." I don't know if he's scared, but he's definitely brilliant.